Malai Mahadeshwara Hills is a temple town situated in the eastern part of Kollegal taluk, Chamarajnagar district. The Lord Sri Mahadeshwara's miracles are beautifully sung by village folk in the janapada style. 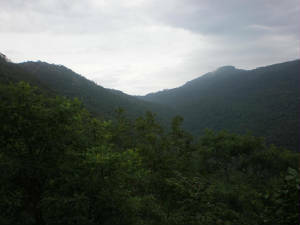 According to tradition there are seven hills identified in the puranas as Anumale, Jenumale, Kanumale, Pachchemale, Pavalamale, Ponnachimale and Kongumale. All these hills form M.M. hills. 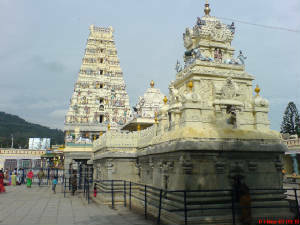 About 600 years ago, Sri Mahadeshwara Swamy came here to perform penance and it is believed that he is still performing penance in the temple's Garbha gudi in the form of Linga. The View of the surrounding hills from the top is breathtaking. Nagamale trek is a difficult 2 day (14 km one-way )trek where you can enjoy the natural landscapes all along the way. Kaadugalla Veerappan had stayed in this MM Hills region for years. At M.M. Hills you can stay at the Malai Mahadeshwara Temple guest houses that have to be booked in advance. Please visit www.mmhills.com for more details. During Deepavali festival a grand celeberation can be witnessed in this place. You can cover Hogenakkal falls also which is 45 km from MM Hills.